You know those blogs you cannot wait to show the world? The ones you kind of almost want to just hit "publish" as soon as they are written?? I have been eagerly awaiting and anticipating the day that I would be able to introduce you all to this sweet friend of mine- Miss Lindsay Zuelich and her fantasmagorical shop- Wood Brain. I can't say enough about this darn shop!!! From her hand-crafted jewelry, to her ridiculously gorgeous driftwood pieces- one look and you'll be hooked por vida (that's "for life" for you non-Spanish speaking friends). Follow her on Facebook, pin her shop...whatever it is you do- do it! You will want to keep track of this girl.
. Website . Shop . Facebook . Where did your love of working with wood come from? I grew up as an only child with a single father. My dad was constantly building things and I was always his little helper... I remember always wanting to keep his scrap pieces of wood to build small models and other small objects. To this day I still play with my scraps. When did you decide that you wanted to make a business out of your love for wood? In the last few years, I've taken my wood working more seriously by fine-tuning my skills with woodworking classes at Cerritos College. The request for my commission and custom work seemed to become more frequent and steady. I found myself enjoying my time spent on each project and that lead me to start my own business doing what I love. 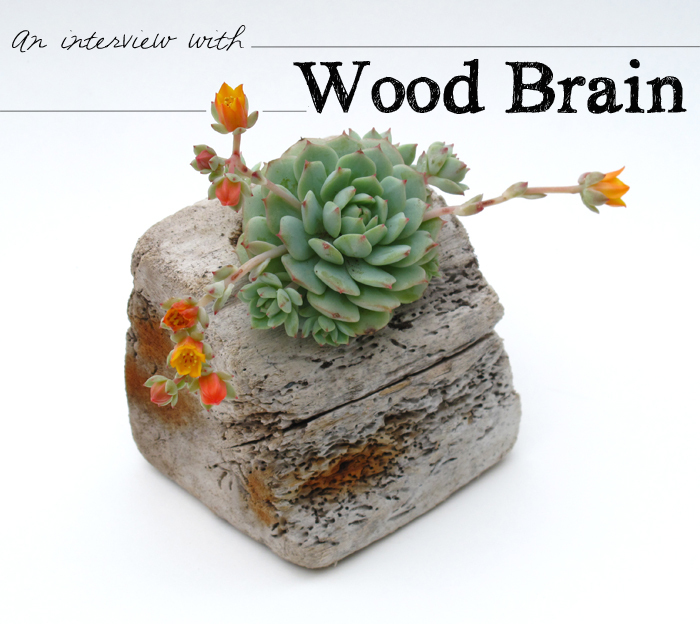 How did you come up with the name "Wood Brain"? It seemed the most fitting for my business name to replicate how my brain operates and creates. 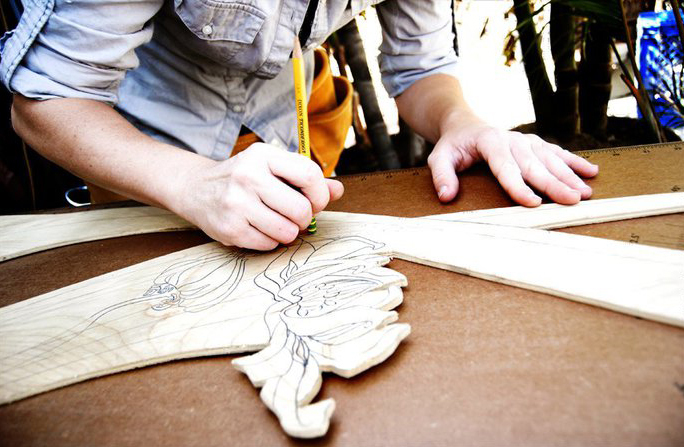 Wood has always been my go-to medium for art, as well as furniture and custom projects. You could say I always have wood on the brain. As I mentioned before I grew up an only child of a single father. When I turned 20 I moved into the rear unit of my dad’s home and still live there today with my wonderful boyfriend and my over sized lap dog Reese, 25 koi and 5 goldfish. I’m an aquatic plant enthusiast and I grow many types of water plants, from water lilies to Chinese water lotus, that I started from just seeds. 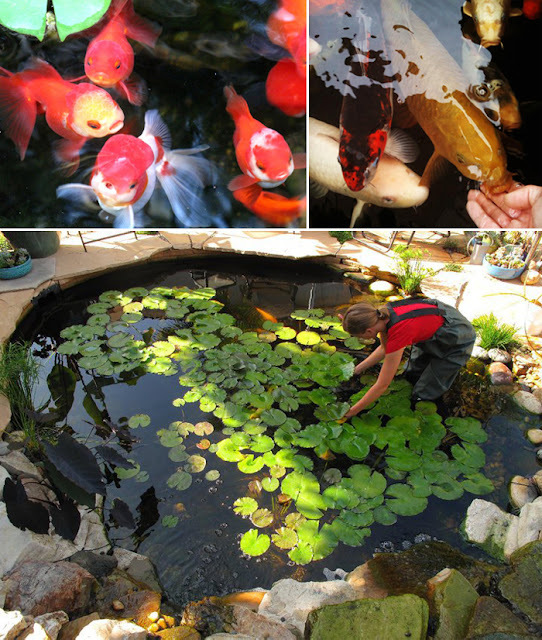 When I’m not wood working I’m tending to our koi and goldfish ponds as well as the yards. Yes, all the wood I use is reclaimed wood that I personally find and collect. I make wood planters from driftwood that I collect from many hikes down to the local coastlines. On any given trip I collect around 50LBS of driftwood. I also make wood jewelry from broken branches, which I cut into more refined pieces of wood, as well as scrap woods from past projects. I never let any piece of wood go to waste, even down to the sawdust, which I also incorporate into my jewelry. What types of wood work best for what you do? I’m a lover of all woods. Because I use all reclaimed and found wood, I usually pick out pieces that show interesting characteristics or flaws, like large knots and interesting distress. I’m currently incorporating specialty types of wood from various locations that I visit along the western coastline (from San Diego all the way up to Alaska). I’m inspired by my tropical home, the trees and plants and the ponds. These organic elements tend to show up in most of my products. It makes me happy when I see healthy trees and for some trees to remain healthy some pruning may be necessary. Sometimes it’s a natural process where a branch may break and end up on the ground and I really enjoy finding those prized pieces. I usually try and wake up pretty early and have a cup of coffee while planning out my day, which is when I figure out which projects to work on. I have a lot of different projects that are at various stages of completion. Some projects require drying in the sun and some require chop saws. I wait for later in day before I dive into using the heavy power tools (that keeps my neighbors happy). By late afternoon I start cleaning up and organizing my tools and projects, that way I’m ready for the next day. On average I put in 5-7 hours of wood working a day. What are some challenges you face, in working with wood? The drying time of the woods inner fibers can take up to month sometimes even years, depending on the thickness. If the wood is not cured (completely dry enough), once it is cut, the wood may crack, split, or the bark may break off. Bike rides with my dog, taking hikes, feeding the fish, tending to my water plants, pretty much anything outdoors. All my tools are on casters and up until just recently I would work right out in front of the garage. I would wheel all my tools out including my workbench, making an outdoor workshop, but I was running into some issues. The set up and clean up really started to eat into my productivity time. It took me almost an hour for set up and take down each day. Weather always plays a big factor with no walls or roof to my outdoor workshop. For my birthday (last month) my dad and my boyfriend got me my own workshop. 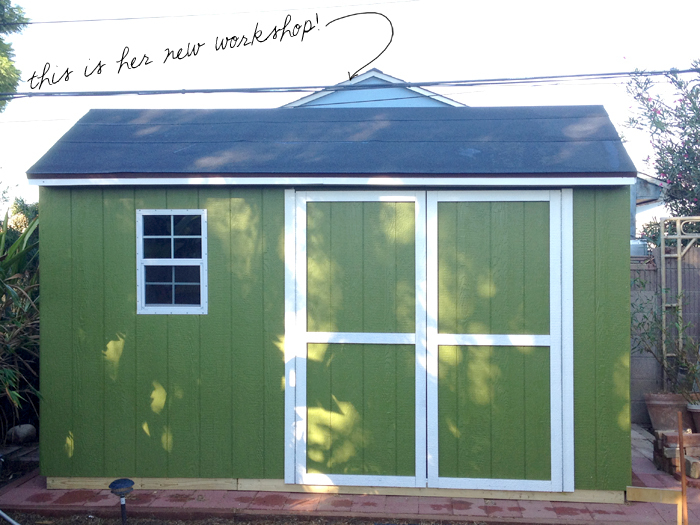 They purchased an 8’x12’ kit from Lowes and in just a three-day weekend we built my new workshop. I’m really looking forward to getting my studio in full working condition. It’ll give me the opportunity to work on my projects at anytime (day or night) and in any weather condition. I recently opened a market stall at Crafted at the Port of LA in San Pedro, which is open Fri-Sun from 11am-6pm (Booth #A122). Most of my products are at my booth at Crafted, and each week I bring in a new product. I also do have a few products online in my Etsy shop! What is your favorite thing to make from wood? 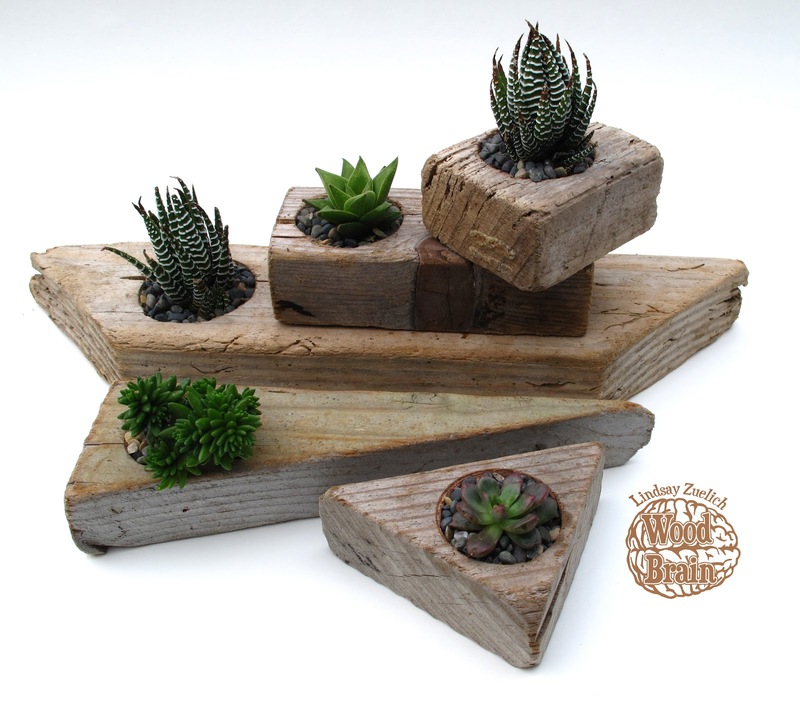 That’s a hard one since I’m always trying to reinvent the wheel with wood, but if I had to pick one of my products that I enjoy making the most it would be the driftwood planters. I love seeing the mix of old life and new together. How do you balance your woodwork with your everyday life? I’m pretty lucky when it comes to balancing my woodworking with my everyday life. I get to take breaks whenever I need them to feed the fish or go on sunny afternoon bike rides. Sometimes I’ll multi-task and I’ll go out to Pacific Diner in San Pedro for breakfast with my boyfriend and then go for a walk along the beach at low tide where we’ll collect cool driftwood together. I know how to sew, work with clay and build scale models. I also enjoy painting. Any future plans you can share with us, for "Wood Brain"? I want to help give back to the trees that I love so much by making annual donations to ‘Trees for the Future'. My goal is to donate enough to plant 50 trees by the end of the year. 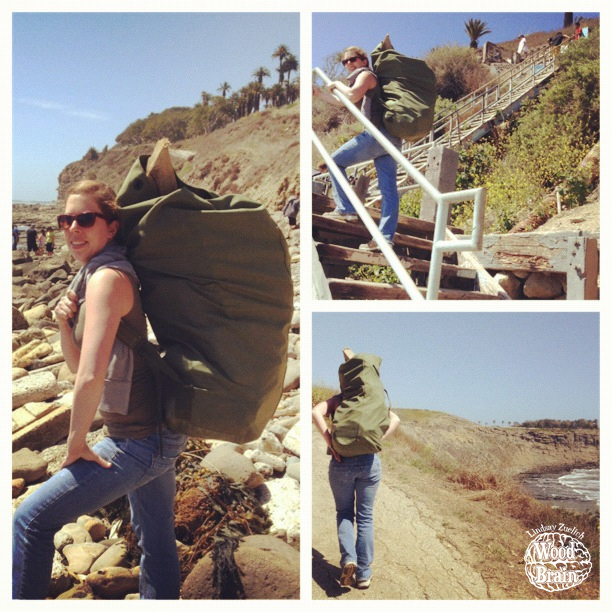 I also plan to continue my beach clean up activities and promote others to help as well. This sweet girl has offered all Sweet Lavender Bake Shoppe readers 20% off ANY ITEM in her amazing Etsy shop! Just enter the code: SWEETDEAL upon checkout! Having a few pieces myself, I can personally testify to the true beauty Wood Brain's products display. I guess you could call me a collector! 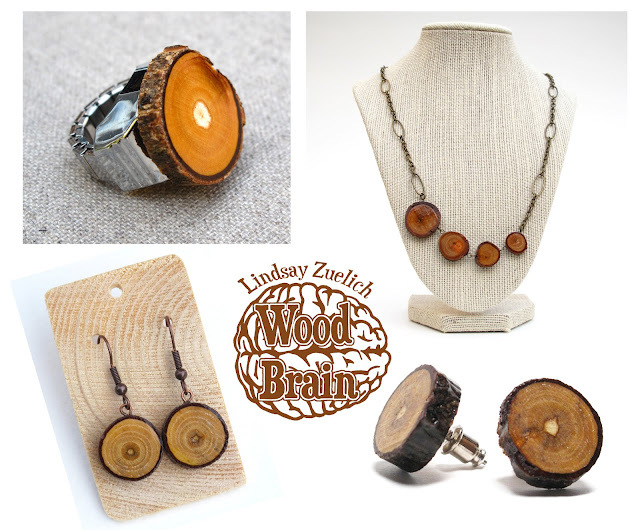 Each and every piece is made with extreme talent; you can totally tell Lindsay pays major attention to detail. The driftwood pieces are, by far, my favorites she creates. Not only are her products one of a kind- so is she. Being both a sweet and kind hearted person, I enjoy every aspect of this super fun girl! If you're in San Pedro, California- PLEASE make sure you check out Wood Brain at Crafted (open on the weekends only) or else take a long gander at other things she offers in her Etsy shop! PERFECT Christmas ideas! Ah! Such a great post! 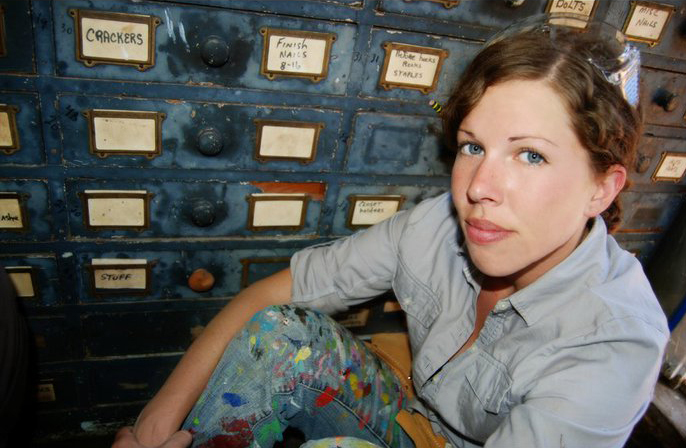 Lindsay is an amazing crafter/artist with such an eye for design. I was very lucky to meet her this past summer at Crafted and buy some of her amazing items. Wow! 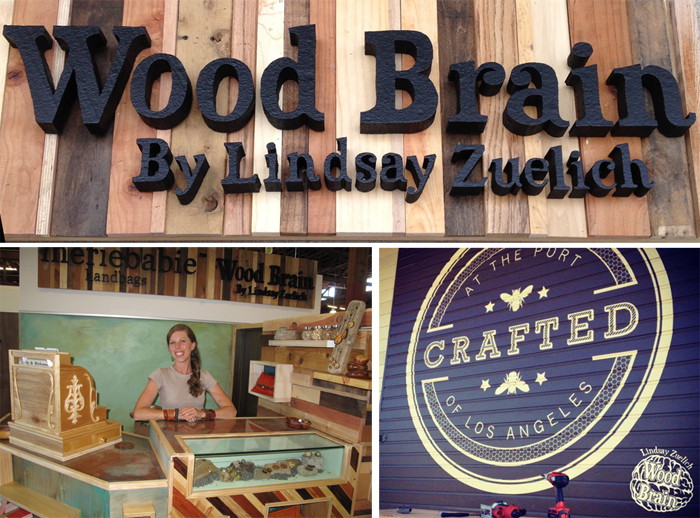 I'm really impressed by Lindsay Zuelich and her Wood Brian creativity. Thank you very much for sharing! I'm hooked! Nice post !!!!!!! Great pleasure for me.Thanks to share these information.